From the outside, even under the cover of pounding rain on a Wednesday night, Cortelyou Commons stands out at DePaul. It is inexplicably ornate, a blip of royalty on an otherwise brownstone and concrete campus. The about-to-be lecture hall is lined with portraits of DePaul’s priestly presidents gone by, deep worn oak plating the walls and chandeliers hanging from the ceiling. By most architectural and aesthetic measures, it could be called pristine. And yet in the time after the doors opened and before Professor Charles Murray was scheduled to speak, the space felt physically lopsided, sloping towards the front. Rows of chairs took up most of the space in the room. The first three were packed with one camp, featuring a handful of students in suits and the occasional Reagan-Bush ‘84 hat. The row directly behind them was empty — white sheets of paper indicating they had been “RESERVED” — but the two rows behind that were similarly dense, these students distinguishable from their peers in front only by the diversity of hair color, skin tone and increased reliance on corduroy apparel. Most of the crowd didn’t show up in earnest until a few minutes before 6 p.m. The tension emanating from the first five rows, however, did not ebb. Every few seconds, a student from somewhere in the crowd turned over their shoulder for a quick look behind — not a where are all my friends? look, exactly, but a who’s here? Do I know them? What are they planning? look. If a newcomer was confused, they might have heard a context clue flitting between rows, the same phrase murmured over and over again: last time. Last time could have referred to Ben Shapiro, a conservative commentator with a mild penchant for the incendiary who was denied a timeslot, venue, or really any form of approval from DePaul last year. He showed up anyways and spoke at a small private theatre down Lincoln Avenue. But Shapiro’s visit, at worst, was political theater. In all likelihood, “last time” for most in the room was May 24, 2016, when College Republicans invited Milo Yiannopoulos to speak at a public event on DePaul’s campus. Twenty minutes into his talk, demonstrators shut him down, ripping the microphone out of his hand, and ultimately lead to several hundred people — supporters and protesters — clashing out on the sidewalk. “The Milo event,” as it became known, was not political theater. It was scary. By most accounts, it never felt farther than a few thrown fists from a riot. But everyone inside Cortelyou was calm, ostensibly. John Minster, chairman of DePaul College Republicans, said the members of his organization were “excited, not nervous.” At the front of the room, the podium had a hastily taped paper sign over it with the letters AEI standing in for the event’s sponsor: the American Enterprise Institute, where Murray holds the title of W. H. Brady Scholar. Minster kept looking out at the crowd not anxiously, exactly, but carefully. He acknowledged the reports he’d heard about a potential walk-out in the works, and he said he hoped the protesters would stick around despite their objections. This time, on the heels of Shapiro’s rejection last August, Minster and Jorin Burkhart — chairman of the DePaul chapter of Young Americans for Freedom — had worked with the school’s newly established Speaker Review Committee to approve Murray’s talk. Minster said they were both on the student task force that helped design the board and, while he didn’t particularly enjoy the weight of oversight (Minster is an avowed libertarian), “they made the right decision” this time around. Then, without much ado, the man arrived. Murray, dressed in a black, buttoned suit and careful outcropping of hair puffing out from the sides of his head, took to the stage after an introduction from Minster. The room was hushed and the air rigid, the hundred or so people inside waiting for whatever was about to happen. Then, it happened. As he stepped behind the lectern, a girl with blue hair shot up from her seat from the middle of the crowd, behind the empty row. “Bye,” said one Republican from the audience. “Thank you,” said another. Then, they were off. Two rows of students, maybe a dozen of them, walked down the aisle and out the room with now-familiar chant: RACIST SEXIST ANTI-GAY, RIGHT WING BIGOTS, GO AWAY. A few moments after they’d left as Murray leaned back into the microphone, a muted heroes’ welcome could be heard from the outside through the walls of Cortelyou. The lecture started. The room never quite relaxed. As Murray laid out his argument for “why Donald Trump is president” — basically, that the increased isolation of intellectually-superior elites has left the rest of America socially, politically and economically bruised — students kept turning to look behind them, as if they expected more. Someone smacked a fly on the back of their neck half an hour after Murray started, and the noise caused half the room to jump. After the lecture was over, Murray opened the floor to a Q&A. 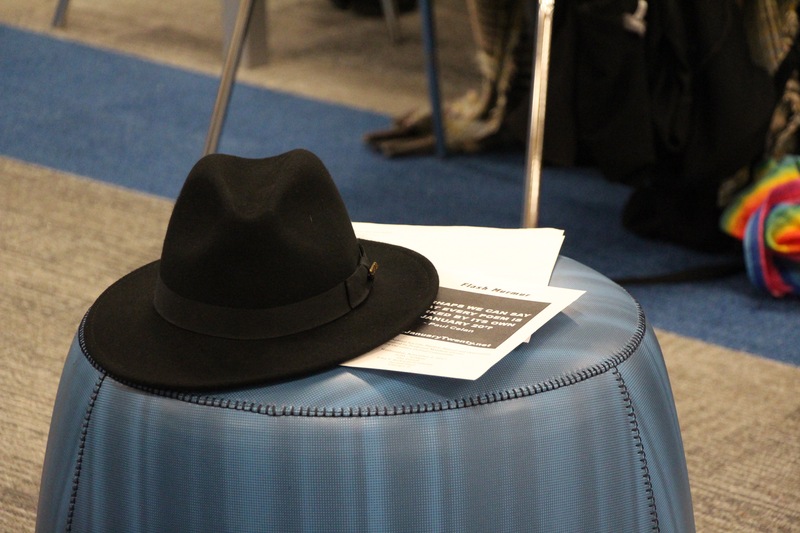 Questioners lined the walls and bounced back and forth between aggressive and softball questions: Is taxation theft? What’s the alternative to identity politics? Can libertarians be religious? This was, ostensibly, the freedom of speech, crystallized and hard at work. At the same time, no one ever said that open democracy was a satisfying process — if they did, they were lying. 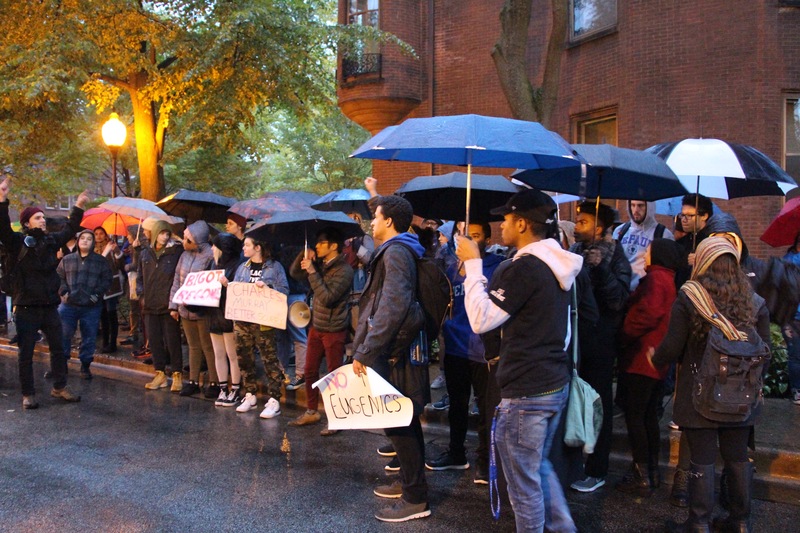 As the rain dampened an already bitter night, a crowd of nearly 100 protesters filed into the small strip of road facing the Cortelyou Commons’ ramped entranceway. They came armed with posters, megaphones and a collection of chants. Charles Murray was inside, and they planned to do their best to make him listen. What do we want? Evidence-based research! When do we want it? After peer review! Hey hey! Ho ho! Charles Murray’s got to go! Murray is a racist! Murray is a racist! 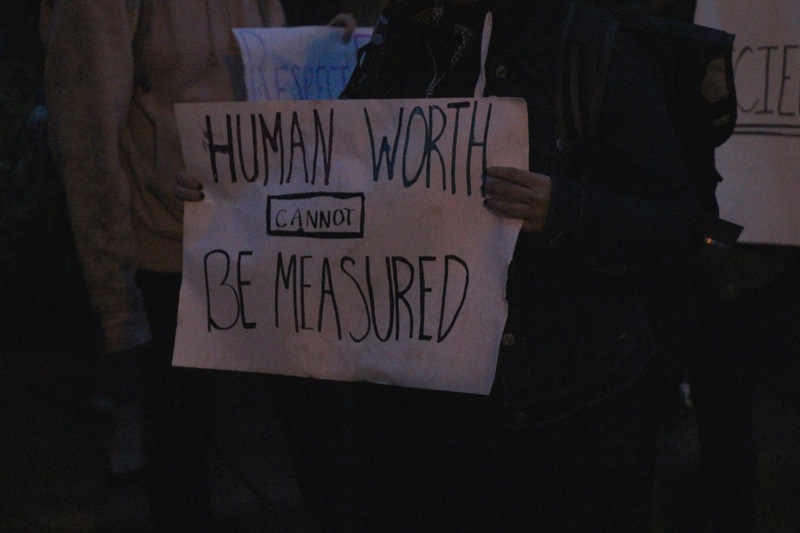 The protest, organized by the DePaul Socialists and Students for Reproductive Justice and advertised via a Facebook event and a scattering of fliers, drew collections of students wanting to vocalize their opposition to Murray’s work — which, among other points, includes research that tacitly suggests racial differences in IQ scores are heritable. 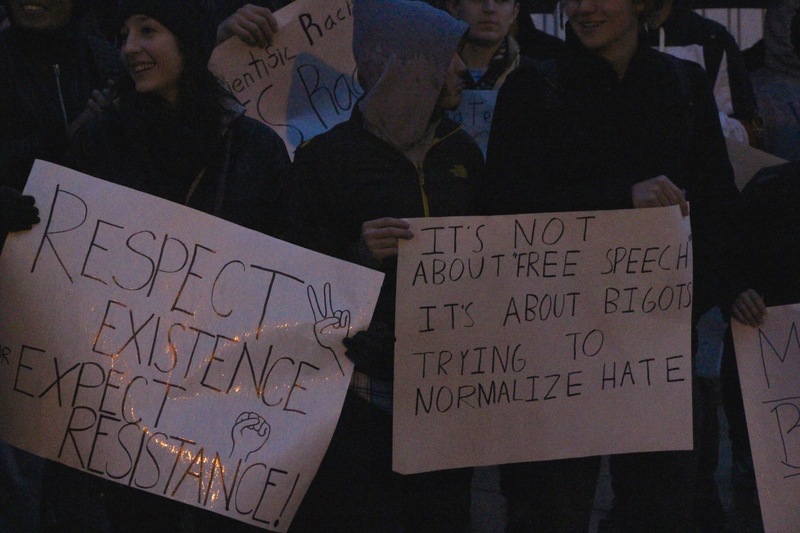 Following last year’s protest at the Yiannopoulos talk, which garnered national attention, DePaul has navigated controversial speaking engagements carefully. Ben Shapiro and Gavin McInnes, both right-wing media personalities, were banned from speaking in August 2016 and May 2017, respectively. The university’s newly formed Speaker Review Committee “did not find sufficient reason to deny Mr. Murray the opportunity to speak on campus,” according to an email sent to students and faculty. 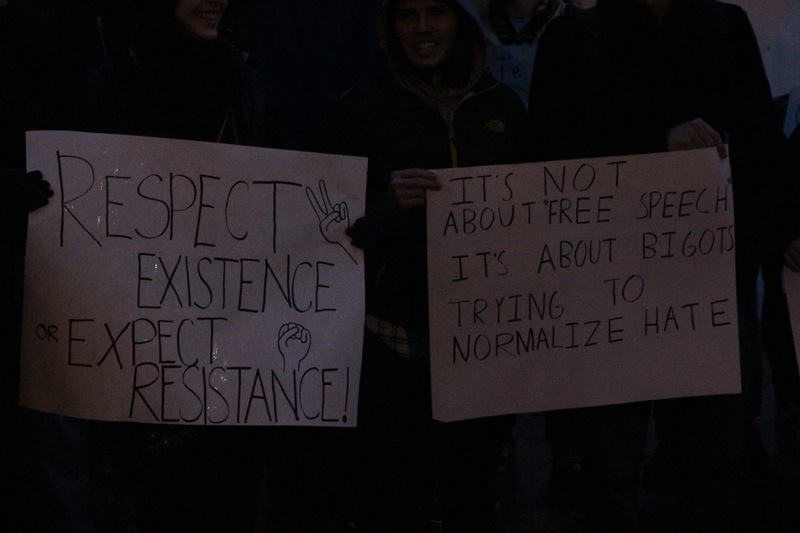 Though protesters generally differed on whether or not they believed Murray should have been allowed to speak — some thought his work constituted hate speech, while others found him less inflammatory than Yiannopoulos or Shapiro — all seemed zealously committed to the cause of exposing Murray’s ideas as unfit for academic discourse. Murray’s 1994 publication of “The Bell Curve” was indeed met with controversy, including arguments regarding the objectivity of the book’s sources, yet it spent weeks on the New York Times bestseller list. The book, which is 845 pages long, cites research that black Americans score lower on IQ tests than white and Asian Americans — and, by extension, suggests genetically designated intellectual differences between races. Jordan Wallace and Kidjie Boyer, both first year acting majors, heard about the protest that morning and, like many other protesters, were particularly upset about this point. Both said they feel Murray’s writings are antithetical to the Vincentian mission. “You’re telling us we’re inferior by bringing this speaker in,” Boyer added. 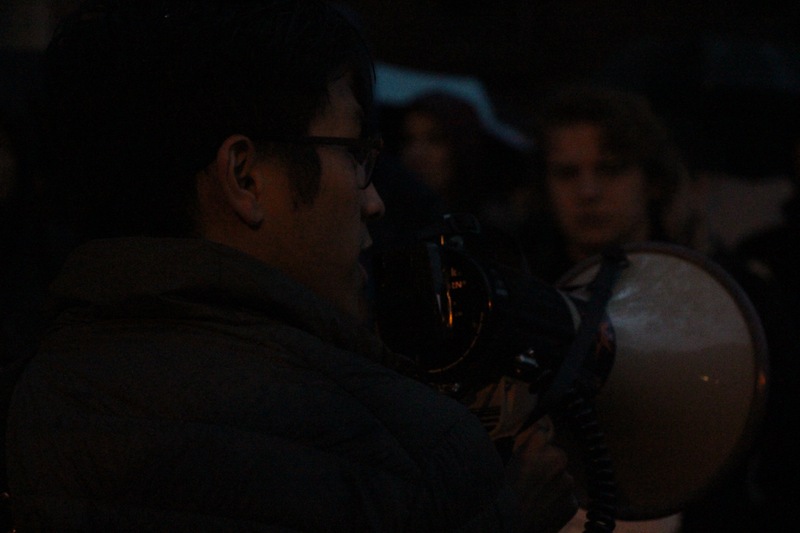 Though neither Wallace nor Boyer are involved in any activist groups on campus, both say they felt an immediate sense of solidarity upon arriving to the event — Wallace, who wielded a megaphone, even led some of the chants earlier in the evening. Despite their anger at Murray’s viewpoints, they see a kind of sacredness in dozens of students standing in the rain to rally against him. 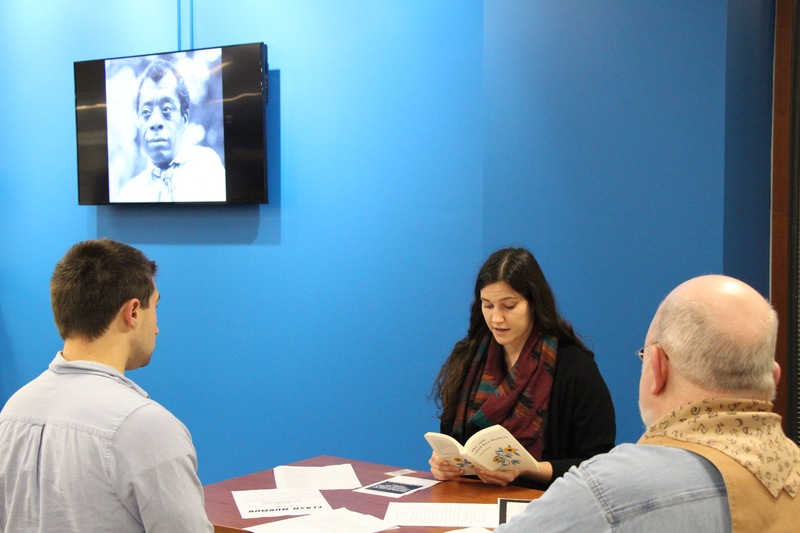 Tucked away from the rain and megaphones across campus, excerpts from Martin Luther King Jr., Audre Lorde and Holocaust survivors lay spread across tables in the second floor of the DePaul Richardson Library. 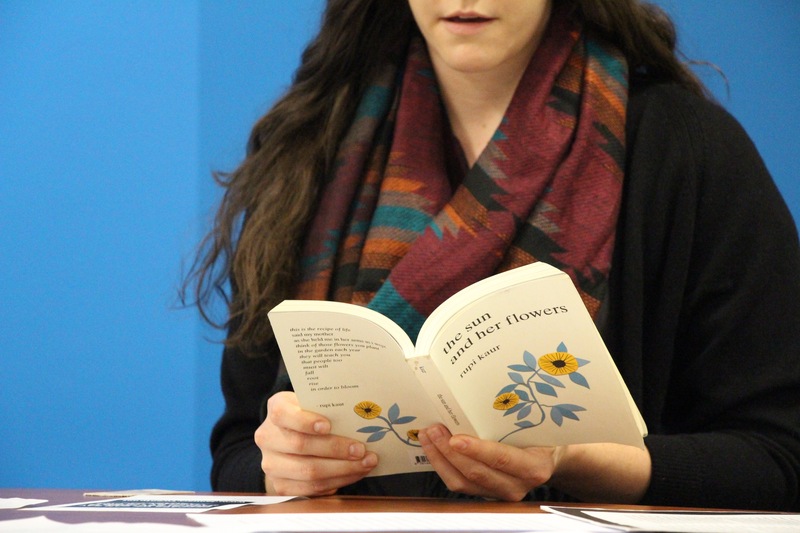 Quietly, groups of students and faculty traded off reading aloud, finding power through art, literature and solidarity. For every dominating voice, there are whispers below begging to be heard. 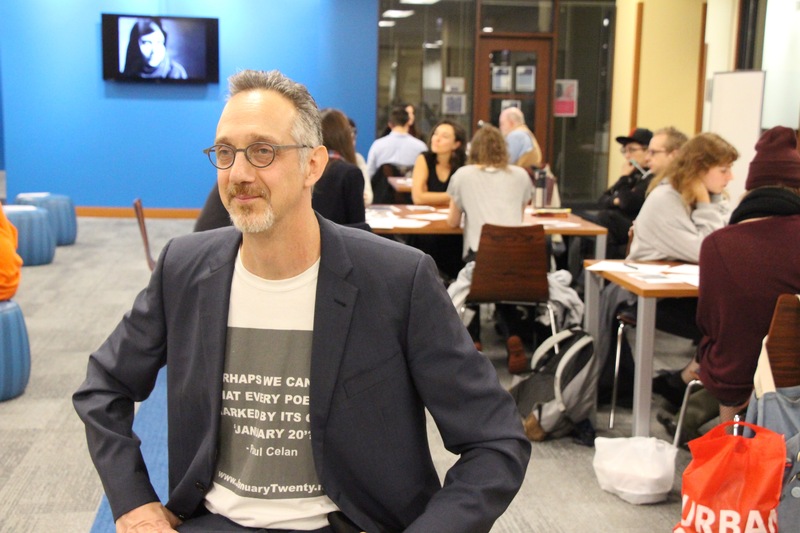 Responding to the Murray event, DePaul professor Matthew Girson organized what he calls a “flash murmur” forum, where students, faculty and staff could share words of those who have experienced oppression, bigotry and hatred. “I wanted to do something where we could have a productive community building event, where we turn our backs to him and turn towards each other,” said Girson. There were no microphones. No podiums. No stages. Participants sat in circles, sharing the same space, working as equals. 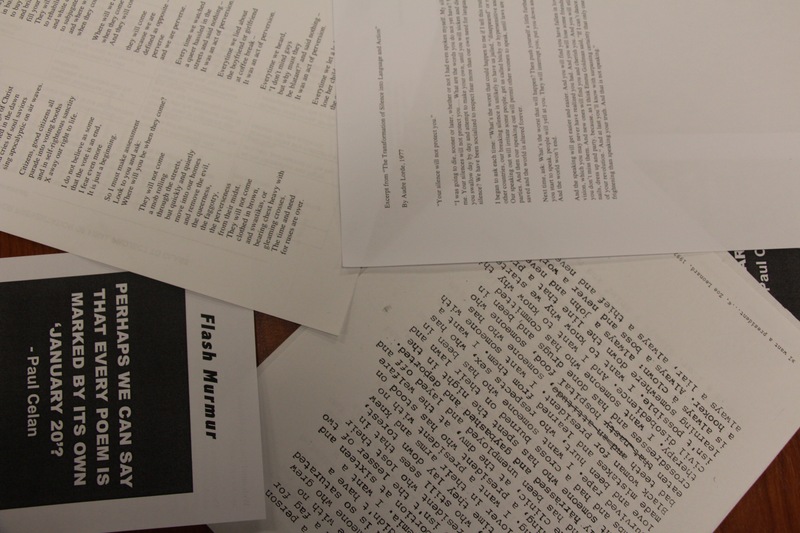 Girson compared the flash murmurs to performance art, open to all to participate, share and reflect. “The whole purpose of this is to reflect on the failures of democracy so we can do what we can to ensure its successes,” Girson said. Girson has been organizing monthly flash murmurs since President Trump’s inauguration on Jan. 20. The date also marked the 75th anniversary of the organization of the infamous “Final Solution,” where Nazi Germany began the systematic extermination of their Jewish population in earnest. But there are, among many others, the paths on which language becomes voice. They are encounters, paths from a voice to a listening You, natural paths, outlines for existence perhaps, for projecting ourselves into the search for ourselves… a kind of homecoming. 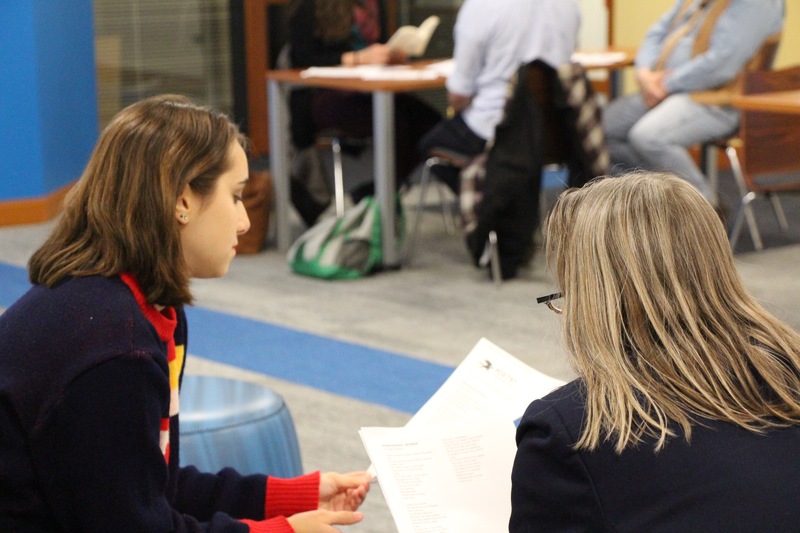 “It truly was such a positive atmosphere,” said Meggi Lampen, a student of Girson’s who went to the event seeking a safe space for connection and expression. Sitting at a table with other like-minded students, the group shared excerpts such as Maya Angelou’s poem “Phenomenal Woman,” allowing her words to speak in opposition. Using the power of art and poetry, these murmurs unite to form a voice for future change and dialogue.